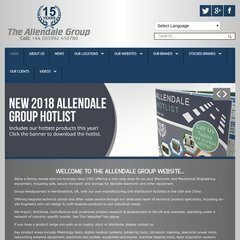 Topics: The Allendale Group, Rc-log, Machine Dro, Pcb-soldering, and Allendale Ultrasonics. ns2.nimbushosting.co.uk, ns3.nimbushosting.co.uk, and ns1.nimbushosting.co.uk are its DNS Nameservers. It is hosted by Nimbus Hosting Ltd (England, Harlow,) using Apache web server. PleskLin is its coding language environment. PING www. (176.56.62.75) 56(84) bytes of data. Pinging the server, resulted in a 97.4 ms response.